Targets aren’t just for determining what bonuses your sales reps get. Targets are useful because they can let users see how a KPI is progressing, and whether action is needed to get the numbers of the right track again. But, though KPI targets contain useful information , it will be lost to users if your targets aren’t visualised in an understandable way. This article will show you 4 ways to visualise your targets to see your business’ status and measure its performance at a glance. By the end of this article, you will know how to use targets to gain different perspectives on your KPIs, and make quick, effective business decisions. KPI targets are very important for monitoring consistent company growth and ensuring that your business is doing what you want it to. But, in order for this information to be useful to managers, it needs to be displayed in an easily understandable way. One of the easiest and simplest ways of showing target information on your KPI charts is to show it as an additional line chart over whatever KPI chart you want to compare the target value to. Showing your targets as a line chart within another chart lets viewers clearly see which time intervals were on target, and which ones failed, allowing quick evaluation of your KPI performance. Target Lines work particularly well with a column chart (as above) because the line clearly cuts through the column, letting you not only see where the column is split, but also that it is split at all. When you want to emphasise the numerical differences between target and actual values over time, displaying these values side by side as column charts will let you see this information more accurately than with a line-based target. Notice that with two column charts being shown over time, you can’t really see any trend information, but what you do get is clear value and difference comparisons. Comparing the two columns with each other lets you visualize the difference between target and actual values, and lets you see the exact difference over time. This information is very difficult to see with a target line chart, which is more useful for seeing whether the target has been met or not. It may be useful to display your target information as both lines and columns on the same dashboard, as it offers two different perspectives on your target data. However, if you wish to display target information on one chart, some dashboard programs allow you to change the target information from lines to columns in only a few seconds, as with our very own Target Dashboard. 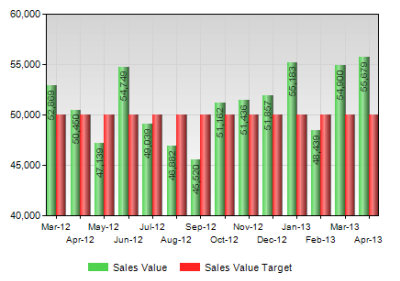 Scorecards let you see detailed information about multiple KPI targets in a small space. This makes them great for management dashboard design (check out our Best Practice Guide), as they give users useful information in a plentiful yet efficient manner. Target information is shown in three ways in a scorecard, and each of these shows you a different perspective on your Target information, all from a single place. As scorecards differ between dashboard providers, I will show you three pieces of target information from Target Dashboard’s take on scorecards. Scorecards offer data drilldowns when you hover your mouse cursor over the KPI’s name. This will bring up, amongst other information, a column chart with a target line through it, giving some context to the scorecard’s numerical data. At the right hand side of the scorecard, you can see a value with a plus or minus sign. This tells the viewer how much the KPI is over or under target. You can also change whether your target information appears as a difference in values, or as a percentage. c. Colour Changes to indicate target status. You might have noticed that the value boxes on a scorecard are coloured. These boxes change colour depending on the status of the target. However, what you should remember is that the colour doesn’t just depend on if the target difference is positive or negative, but on whether the change indicates something good about the KPI; if you wanted to be under budget, for example, a fall in target change would be a desirable outcome, and be coloured green. Scorecards are a great way of showing target information from different KPIs in one place, and can let the user quickly absorb the information to make better business decisions. While I’ve discussed gauges at length before, it cannot be argued that they are one of the most useful dashboard items for showing the immediate status of your company. 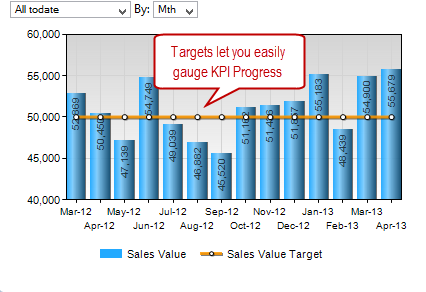 Gauges can do this most effectively when displaying KPIs that have targets associated with them. 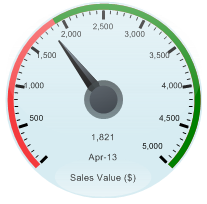 Ideally, gauges will display the most recent KPI values, along with KPI target information. As you can see above, this target information shows up on the gauge as the red area; if the gauge needle is in the red, it is obvious to managers that action must be taken. Perhaps the worst thing about gauges is that they only show data at a particular point in time, so even if a target has been met, there is no context (e.g. has the actual value fallen from the previous month, despite still meeting the target?). 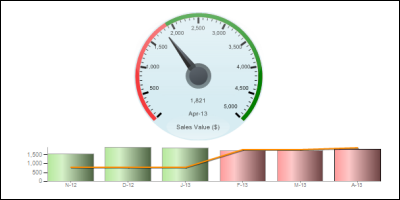 Therefore, you should always include a time based chart such (as a column chart) with your gauge. 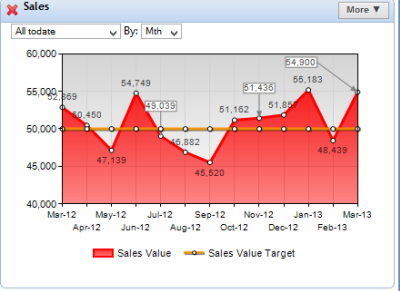 Target Dashboard creates a column chart for your gauge automatically! Easily understand your KPI target information with these visualizations! For many KPIs, comparing measured values against targets created by your company lets you determine if your business is performing the way it should. Therefore, managers need to be able to visualize target information in an understandable, actionable way. In this blog, I’ve shown you the four ways that I find most effective for displaying KPI targets. While some of these may seem quite simple, the most effective KPI dashboards are those that are the simplest to glean information from. Using these visualizations, you can use your KPI targets into make quicker, better business decisions. If you’ve a few minutes to spare, why not visit our visual dashboard database to quickly find the chart you need for your data. Or, if you’ve got a little more time, learn how to visualize targets on a dashboard in mere minutes by signing up to our free 30-minute webinar. 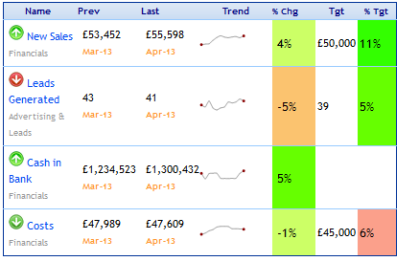 After seeing this, you’ll be amazed how quick and easy it is to manage your KPI data!